1. Preheat the oven to 170°C, gas mark 3. Put the cream in a small saucepan with the split vanilla pod and seeds. Put over a medium heat and bring almost to the boil. Set aside for 10 minutes. 2. Remove the vanilla pod (rinse, dry and save to make vanilla sugar). Return the cream to a medium heat and bring almost to the boil. Put the 100g chopped chocolate in a heatproof bowl. When the cream is steaming, pour it over the chocolate and wait for 1 minute before stirring until smooth. Cool for 10 minutes, then whisk in the egg yolks. 3. Roughly crush 2 /3 of the raspberries with the sugar using a fork; divide between 6 ovenproof glasses or ramekins. Carefully pour the white chocolate custard over the back of a spoon into the ramekins, over the raspberries. Put in a deep roasting tin and carefully pour boiling water halfway up the sides. Bake for 25 minutes, until just set with wobbly centres. Remove the ramekins from the roasting tin and allow to cool. Chill for at least 4 hours or overnight. 4. Shave the remaining chocolate into rough curls using a vegetable peeler. 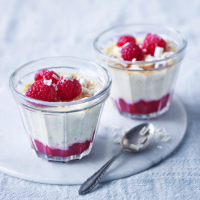 Serve the chilled custards topped with the remaining raspberries and chocolate shavings.